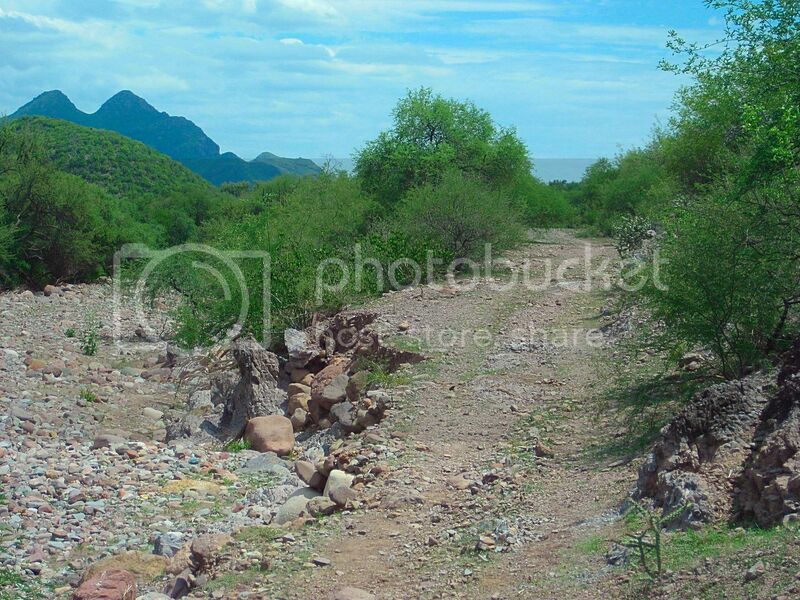 Has anyone been on it to see if the road between Mulege and San Isidro is open to vehicles? How bad is the rock slide or whatever is blocking the trail? Tom, did you catch the video of the surfers in a Tacoma doing that road, and manually moving rocks to get through? They did not know where they were, but it was that road and it was a really good video. I have never tried to find that road, but I would like to! If you are looking for another vehicle to join the quest, what is your time frame? I am still in Alaska, but plan on heading south in a couple of weeks. The rain squall that passed through today left the peaks above Anchorage white! David- I watched the video but did not catch the date it was made. There was much more greenery in the video than when we drove it a couple of years ago. Bet TW knows the dates of our crossing. I recognized parts from the video, particularly the steep switchbacks. Other parts of the video made me wonder if it is the same route as we did. It is also referred to as the Guajademi road - or something very similar. A few years ago some folks from Mulege provided us with good info on whether or not is was doable in a 4x4. I remember watching the video quite a few months ago, but I can't think of what forum or key words to search for it would be. The impression I had of what I remember viewing, is that the video was originally posted somewhere else, and was several years old. If I am correct, there have been a couple of flash flood events since they made their run. Wish I could figure out where to find it! 4X4ABC was along on our trip - I'll try to figure out when it was (April 2016) in the event the other video shows up - we can compare dates. edited to add the correct date of our adventure. Off topic, but of interest, I am sure. Folks in San Jose de Mag say the route to Guadalupe is now open, even graded. We are planning a trip Oct 6th and I will post. Well, that would be major! I went from the mission on that road and in less than two miles was washed out by an arroyo gully. I know a bit further east, where it goes down the mountain, it was totally obliterated. Please keep us informed. This will be good news to the ranchers in the mission valley and maybe will lead back to some restoration of the site? The mission church's west wall from the 1750s. This is west and uphill from the cinder block building in the clearing. The first erosion on the road towards San José de Magdalena. The second washout beyond this one was complete, I had to turn around. That is great news. That has been a favorite day trip out of Mulege for many years. John we did the route in April 2016, here is my trip report. Some do refer to it as the Guajademi trail. While Guadajemi is off in another canyon, the trail past it to Mulegé was one of the routes of El Camino Real... Just for mules, not autos! 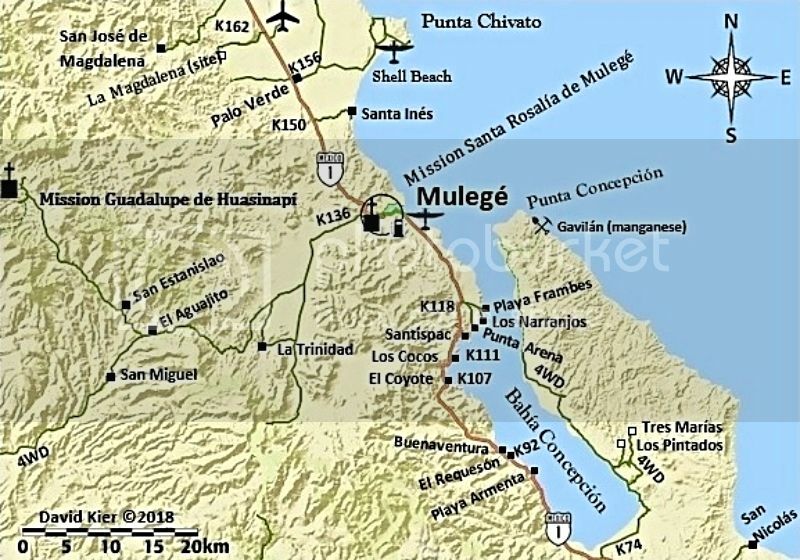 Your auto road forks to the west then north to Mulegé. The video says it was from 3 years ago. I did the trail in April 2013 and April 2016 and I don't remember that much green in the road. But who knows it could be the the same trail. Democracy is like two wolves and a lamb voting on what to have for lunch. Liberty is a well-armed lamb contesting the vote. Hi Kris... what was the road surface condition? Would it be okay for 2WD vehicles, in your opinion? Anyone have a set of tracks they can share? I would love to check that out on y moto this year? For reference our vehicle is a 2000 Explorer stock Bauer Ed. with 255/70/16 Michelin street tires run at about 22#. 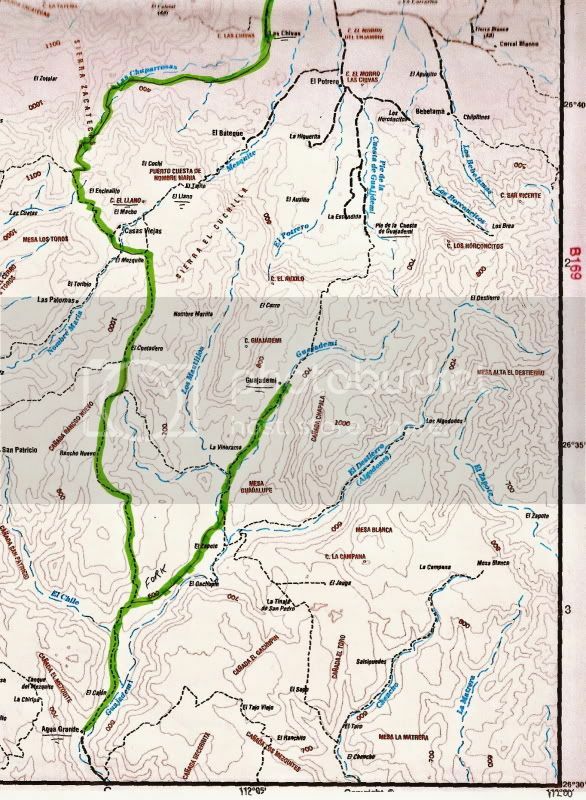 The report is a mileage log and includes GPS data and elevation for key points. The log is as accurate as Garmin and Ford's odometer could provide. 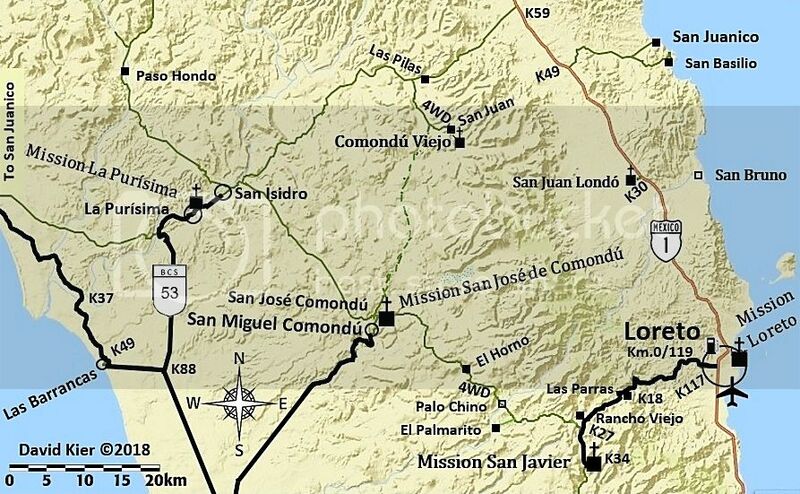 Mile Zero is starting North from San Isidro at 26.12.866x112.01.577. Excellent road to Purisima Vieja at mile 12.3 then to Paso Hondo at mile 15.4. Both are oasis villages with some great scenery. Mile 17.8-Springs and ponds on left. Mile 21.2-water crossing/palms and on to Buenos Aires at mile 25.9. Mile 32.2. 26.32.962x112.06.834. Elev.2100. Sign: El Llano straight, Guajadami to the right. Go straight. From here the road is steep and rocky with a lot of erosion. Low range used to the top of high plateau at Mile 36.7. Elev. 3350 at 26.35.899x112.07.222. Mile 43.1. 26.39.029x112.08.07. Elev. 3429. Now down the cuesta, steep and rough but not nearly as bad as the earlier one. There has been traffic up and down this area since we were on it and turned back a few months ago. I think we could now go up this one ok.
Mile 46.2. 26.40.320x112.07.130. elev. 1346. This position is right by the ranch at the bottom of the cuesta. Rancho El Llanito. It is relatively new. This is the important coordinate for anyone doing this trip north to south since it is not shown on the maps and in my experience the Baja Atlas and other maps are only an approximation of the roads in this area. 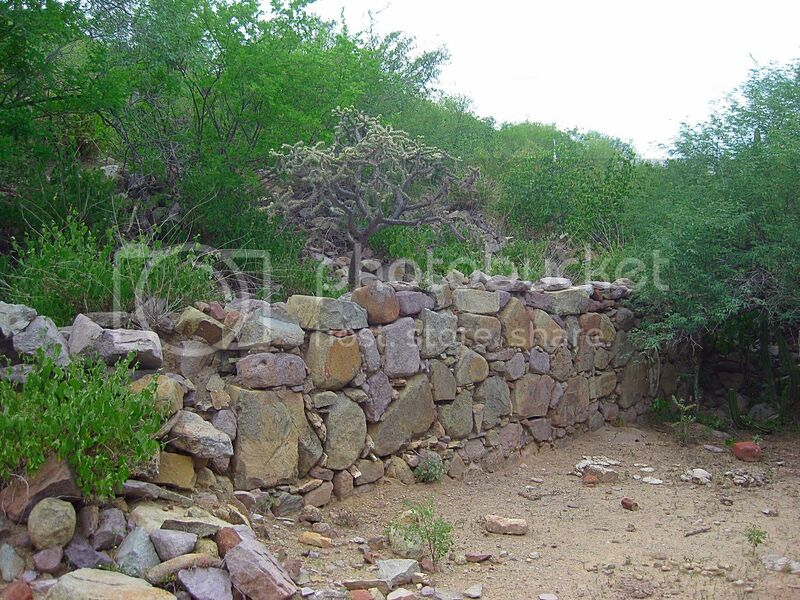 From this point you are on the road that goes straight to Mulege. There are occasional roads that come in from both side notably at Mile 50.8 which has a sign pointing back to Rcho El Llanito. I believe the other fork here leads to the area of El Potrero and El Batiqui and Pia de la Cuesta Guajadami. I have motorcycled in that area but not since the hurricanes changed some of the roads a few years ago. Note that I have not called this the Guajadami Road since it splits off from the old mission route and is generally to the west of it. Continue straight into Mulege arriving at Hwy 1 (icehouse road junction) at MILE 67.3. This trip took about 6 hours so an average speed of about 10 mph. Thanks to Mulegena for the trip report on Baja Nomads that inspired us to do this trip. The scenery was wonderful although I would still rank the San Juan de la Pila road as the slightly more spectacular but I am really splitting hairs on that call. Do them both and tell me what you think!